Hey there! I am scrapping the weekend away with 40 great ladies at our lovely hotel in Canmore Alberta! Between travel, set-up, teaching classes and demonstrating fabulous CM products like the Border Maker, I haven't got much done myself, but we are having a great time! This project was created using Reflections Paper Flowers and adhering them to the background piece of cardstock in the shape of a heart. 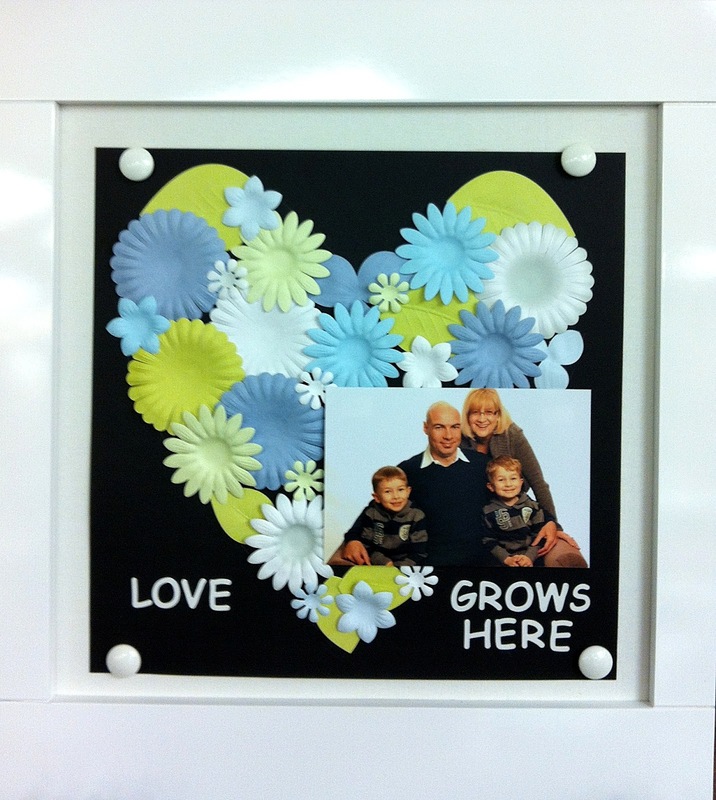 One 4 x 6 photo was attached off to the side, and the title "Love Grows Here" was added with letter stickers. The whole thing is displayed on the Sleek White Magnetic Everyday Disply board with the magnets it comes with. The genius part? When I tire of this particular display, the page can be slipped into my album and a new display can be easily added! I love the versatility of it! Of course you can use paper flowers in colors to match your decor or photos and change up the title to suit your photo. It's a fresh way to display a favorite photo! This project was designed by Creative Memories, and you can get a step-by-step instruction guide here. Have a great weekend...I am happy to still have tonight and a good part of tomorrow to play with my scrappy friends! PS...if you are interested in attending one of our scrapbooking retreats, we will be holding our next one November 30 - December 2, 2012. Sign up to receive my monthly newsletter in the box on the sidebar to be the first to know about registration happening in early fall!